Author: Klaudia Dombrowsky-Hahn. Series edited by: Gudrun Miehe, Brigitte Reineke, Manfred von Roncador. 12 pp. Roman, 372 pp. 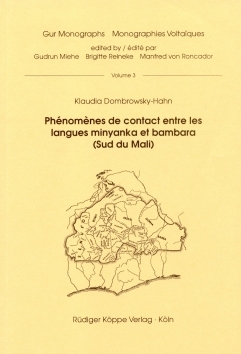 This study – which is derived from the author’s PhD thesis – focuses on various aspects of language contact between Minyanka and Bambara. The Minyanka language is spoken by the Minyanka people situated in the districts of Ségou and Sikasso in the south of Mali. Minyanka belongs to the group of Senufo languages, which in turn form a sub-group of the Gur branch of the Niger-Congo languages. Minyanka is influenced by various languages: by Bambara – spoken to the north and west of the Minyanka region – and by Dyula, the trade language spoken throughout the south of Mali. Bambara and Dyula both belong to the Mande branch of the Niger-Congo languages. The present study concentrates on those borrowings and loan translation processes which occur within Minyanka as a result of the influence of Bambara in particular. The first chapter provides an introduction to the topic as well as an overview of relevant theoretical approaches to language contact and an account of the methodology adhered to in the study. The following analysis is devided into six grammatically structured chapters and deals with the contact phenomena on the levels of phonology, the morphology of nominal classes and nominal stems as well as the syntax of genitival phrases, relative clauses and adverbials. An eighth chapter summarizes the types of borrowing from Bambara and their effects on Minyanka. A German summary of the analysis is appended to the volume. Dombrowksy-Hahn’s 1997 doctoral dissertation from the University of Bayreuth describes linguistic evidence of language contact between two Niger-Congo languages. Minyanka is a Senoufo language spoken in southern Mali near the western border of Burkina Faso. Bambara belongs to the Mande language group and is a language of wider communication. Data were collected from villages in the Ségou Region representing two of the eleven Minyanka dialects: Mpessoba on the western side of the region where the Sanyi dialect is spoken, with a longer and more intensive contact with Bambara; and Yorosso on the eastern side where the Gbajenga dialect is spoken, with a shorter, less intensive period of contact with Bambara. The objective of D-H’s study is to demonstrate the validity of Sarah Thomason and Terence Kaufman’s claims (Language contact, creolization, and genetic linguistics, Berkeley: University of California Press, 1988) concerning the direction, degree, and motivation for borrowing linguistic phenomena as well as the usefulness of their model for predicting the potential for language shift. As she systematically investigates each level of linguistic contact (phonological, morphological, lexical, and syntactic), D-H assigns the level of change to the scale of sociolinguistic contact developed by Thomason and Kaufman. On the low end of the scale is the sociolinguistic situation of occasional contact characterized by low bilingualism in the speech community. At the high end of the scale is a language that has undergone structural modification as a result of linguistic pressure from a second language and whose speakers are in a position to shift completely to the second language as a result of social and cultural pressure. The introductory chapter begins with a background description of the historical and sociolinguistic contexts of the two Minyanka dialects. The author then discusses theoretical perspectives on language contact, borrowing, and codeswitching, highlighting work by Einar Haugen and Uriel Weinreich and focusing on the contrast between borrowing and codeswitching. The discussion closes with a description of the quantitative method used to distinguish forms borrowed into the Minyanka lexicon from those used in codeswitching. Crucial to the support of her hypothesis is showing that Minyanka speakers in the high contact situation with Bambara are borrowing from Bambara, as opposed to switching between the two codes, and that this borrowing is pervasive, resulting in the alteration of the structure of the Minyanka dialects, though to different degrees that appear to be related to the length and intensity of contact. D-H’s conclusion is that the two Minyanka dialects can be classified as belonging to level 2 and 3 on Thomason and Kaufman’s scale. The classification is not uniform for all types of borrowing. The facts described in her dissertation confirm her hypothesis that the cultural and linguistic pressure of Bambara has resulted in a more advanced degree of borrowing by the Minyanka spoken in Mpessoba that has had a longer and more pervasive contact with Bambara than the Minyanka spoken in Yorosso, to the extent that it has caused systematic restructuring of the language.